Betsy W. Decker, of S. Cascade Dr., Springville, died Tuesday November 13, 2018 in Bertrand Chaffee Hospital, Springville, at the age of 90. She was born May 10, 1928 in Penn Yan, New York a daughter of the late Ivan and Velma (nee Carpenter) Ross. She was a direct descendant of Betsy Ross and graduated from Penn Yan Academy. She attended Alfred University where she was a cheerleader. She was a Retailer with Engels Jewelers and Masons Sportswear and Shoes both in Springville. 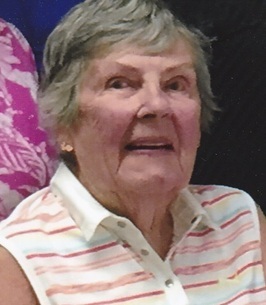 She was also a court clerk, member of the D.A.R., the Springville Country Club, St. Paul's Episcopal Church in Springville where she taught Sunday School. She was the Springville Chamber of Commerce Secretary for many years, sang for Franklin Roosevelt's wife and loved to golf. She is survived by her husband - George D. Decker whom she married in 1947; two sons - Terry (Carol) Decker of Hilton, NY, Tim (Eileen) Decker of Hamlin, NY; four grandchildren - Chris (Heather), Kate, Andrew and Julie Decker; and three great-grandchildren - Derek, Addy and Mylinda. She was preceded in death by her parents; a daughter - Kimberly Decker and a sister - Carol Morton. Friends may call Thursday November 15, 2018 from 5-7 pm at Smith-Weismantel Funeral Home, 271 E. Main St., Springville. Private funeral services will be held at the convenience of the family. Burial will be in Maplewood Cemetery, Springville. Memorials may be made to Bertrand Chaffee Hospital, 222 E. Main St., Springville, 14141. We encourage you to share any memorable photos or stories about Betsy W.. All tributes placed on and purchased through this memorial website will remain on in perpetuity for future generations. George, I am so sorry to read about Betsy. She was adored by many. Prayers for you and your Family at this very hard time.